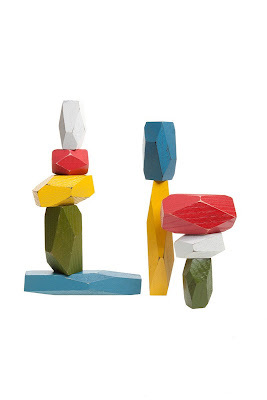 I was on the hunt for a birthday present for the child of some design-conscious friends of ours, who also have a preference for mid-century modern kids' toys. 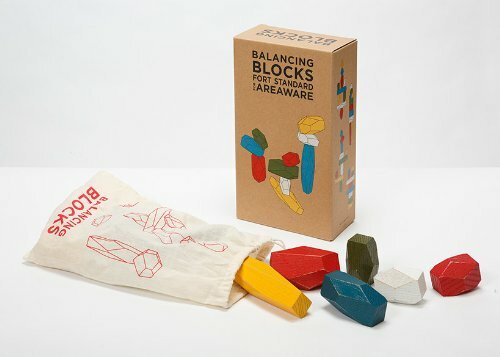 I happened upon these multi-colored Areaware balancing blocks and I think they'll be the perfect gift. Areaware also happen to be the makers of Cubebot, so they're quickly turning into my go-to company for mid-century modern toys. The blocks were created for Areaware by Fort Standard, a design studio in Brooklyn, and are crafted from sustainably harvested wood and covered in non-toxic tints. They also created this super cute video about the balancing blocks, which reminds me a lot of the Sesame Street claymations from my childhood. Nice but expensive... $45 for blocks?! I'll stick with toys from garage sales... then if my kids don't end up being interested in them, I haven't wasted too much money! And wood toys work for some people (maybe those with an only child? ), but if one of my toddlers hurls a toy and it hits her sister, I'd rather it be lightweight plastic! I ended up having to get rid of any wooden toys we had for safety's sake!